At Medjet, we know the safer and more connected our members feel, the more they can enjoy their travels. 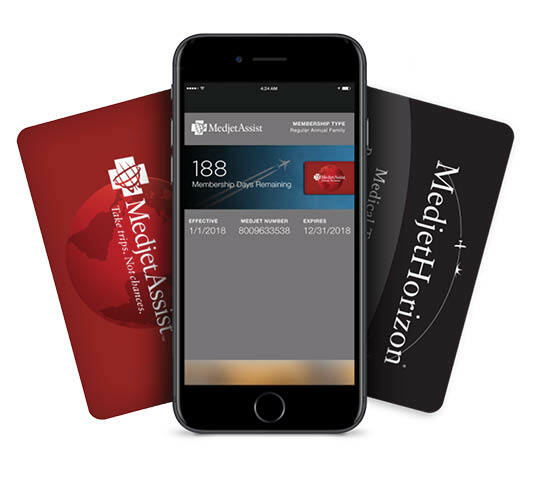 The Medjet Digital Membership Card is a functional way for our globetrotting members to keep their Medjet card on their phone for on-the-fly access to their Membership ID number, US and International Medjet emergency numbers (direct link dial), and a countdown clock to their Membership expiration. After entering your Membership number and information below, you will receive an email containing your card file. This must be opened on your phone, it is not a “download and print” card. Medjet's digital card is currently only available for iPhone / Apple Wallet. Google Wallet coming soon. This is a great pre-trip planning tool. MedjetHorizon members may access research to over 260 countries and cities worldwide, and sign up for personalized travel advisories and alerts along their intended itinerary. Signing up for the US Department of State’s (free) Smart Traveler Enrollment Program (STEP), a free service that allows U.S. citizens traveling or living abroad to enroll with the nearest U.S. embassy or consulate. Canadian citizens have access to Registration of Canadians Abroad. Existing MedjetHorizon members can log into the eTravel Alert personal travel advisory portal by entering their MedjetHorizon membership number in the field below (please note: your alphanumeric membership number is case sensitive). As of June 5, 2017, the WiMedjet app will no longer be available for use. Wireless Traveler, the company that has been providing all WiMedjet app and WiFi Wireless calling services, will be handling all accounts directly – featuring the same Terms of Service and low calling rates. Tip: While traveling, be wary of “free WiFi” networks, especially in tourist areas. Unknown networks may NOT be secure, and worse, may be after your personal information. Click “Save” and start calling. If you don’t know your account number, or need any additional assistance, you may email Support@WirelessTraveler.com or call 1-866-700-3883.